Written by Anna May on December 12, 2016 . Posted in Group activities, News, Science outreach. Anna Laromaine appears in the MUY INTERESANTE magazine number 427 (December 2016). 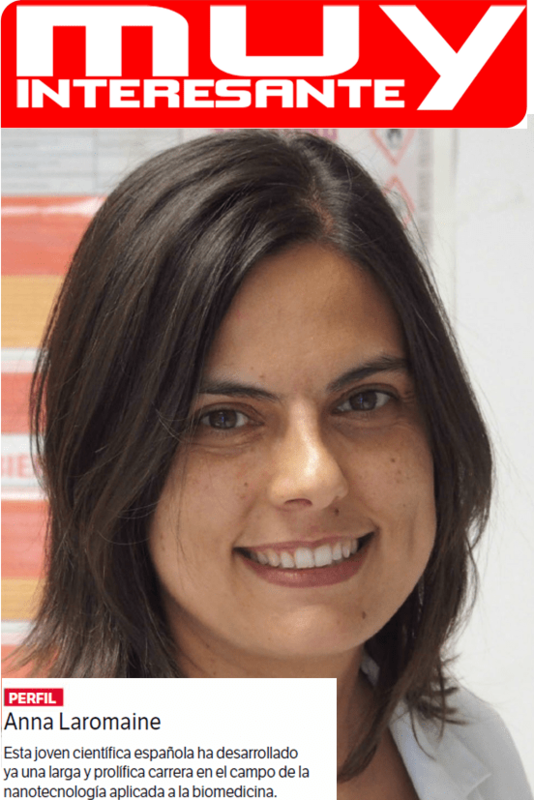 The magazine article highlights Anna’s carrer: from studying Chemistry at Universitat de Girona, to her PhD at ICMAB, and her multiple Postdoctoral Fellowships at University College London, MIT and Harvard, where she worked in different fields related to nanomaterials and biomedicine, before returning to ICMAB. The article also emphasizes the fact that Anna is not only a prolific researcher; she also teaches at Universitat Autònoma de Barcelona, gives seminars and talks in high schools, and has founded her own startup company. We hope you enjoy the article and learn a little bit more of one of our group members! Congratulations Anna! Written by Anna May on August 22, 2016 . Posted in New publications, News. Good news! 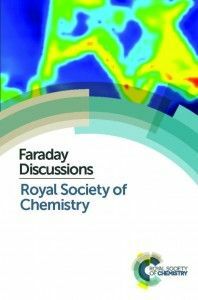 One of our last published articles in Nanoscale was the main star of the inside cover of the journal (Issue 30, Volume 8, 2016). 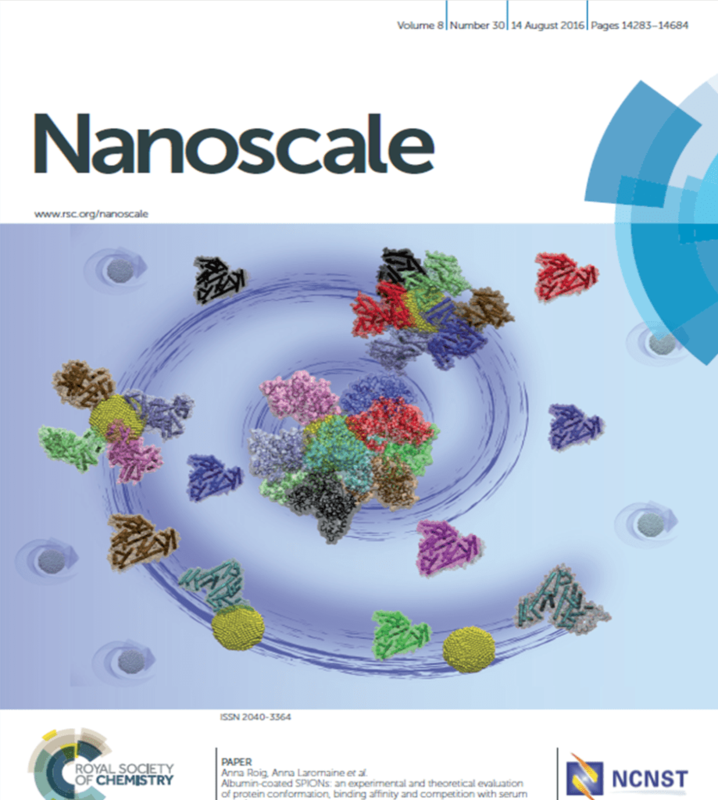 Hot off the press at Nanoscale! Written by Anna Roig on May 25, 2016 . Posted in New publications, News. Albumin-coated SPIONs: An experimental and theoretical evaluation of protein conformation, binding affinity, and competition with serum proteins, by Siming Yu, Alex Perálvarez-Marín, Caterina Minelli, Jordi Faraudo, Anna Roig* and Anna Laromaine*, has just been accepted for publication in Nanoscale, DOI: 10.1039/C6NR01732K. 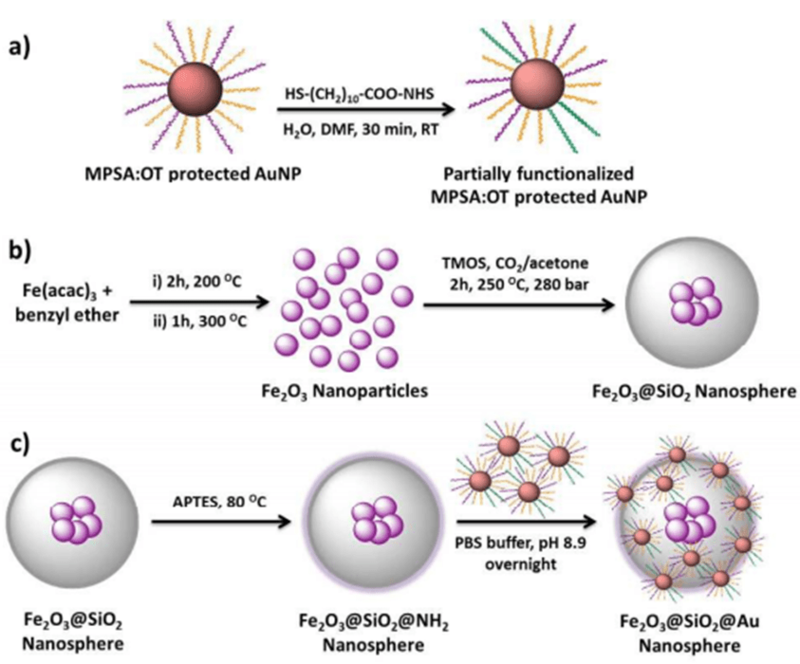 Among inorganic nanoparticles, superparamagnetic iron oxide nanoparticles (SPIONs) show great promise for medicine. In this work, we study in detail the formation, composition, and structure of a monolayer of bovine serum albumin (BSA) on SPIONs. We determine, both by molecular simulations and experimentally, that ten molecules of BSA form a monolayer of BSA around the SPIONs and their binding strength to the SPIONs is about 3.5×10–4 M, ten times higher than the adsorption of fetal bovine serum (FBS) on the same SPIONs. We elucidate a strong electrostatic interaction between BSA and the SPIONs, although the secondary structure of the protein is not affected. We present data that supports the strong binding of the BSA layer on SPIONs and the properties of the BSA layer as a protein-resistant coating. 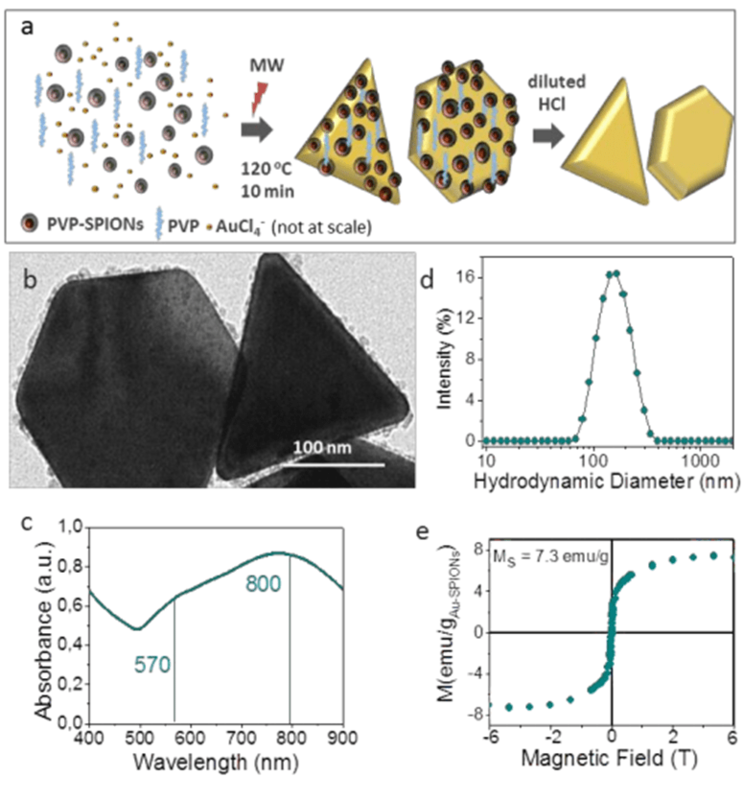 We believe that a complete understanding of the behavior and morphology of BSA-SPIONs and how the protein interacts with SPIONs is crucial for improving NP surface design and expanding the potential applications of SPIONs in nanomedicine.